"displayed in the form of a visible, clearly worded and unambiguous notice indicating that a consumer does not wish to receive uninvited doorstep sales callers. " Or To A Front Gate (We Would Call This A Prominent Place*). may follow this code of practice. 7.4.3 (a) not call on premises in recognised* no cold calling zones where there is a message prominently displayed from the consumer in the form of a written note or sticker indicating support by police. 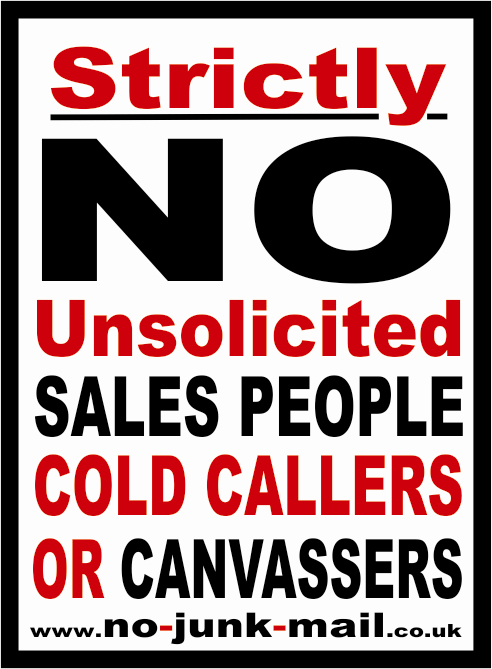 (b) not call on any premises where there is a message prominently displayed in the form of a visible, clearly worded and unambiguous notice indicating that a consumer does not wish to receive uninvited doorstep sales callers.